This is a one of a kind European Style boys formal 4pc vest set by Ferrecci features outer pockets, 4 button closure, adjustable back, luxury microfiber construction and the matching Necktie, Bowtie and Handkerchief make this THE perfect, all in one, package deal! 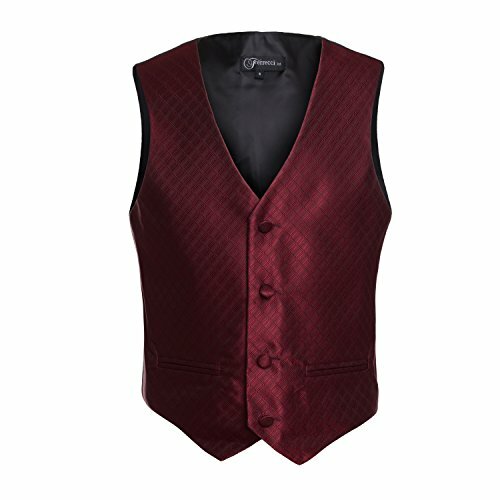 This vest set is perfect for use with or without tuxedo suits at special performances, weddings, communion or church related events, school uniforms, school graduation, Bar Mitzvahs and many other formal ocassions. Please refer to the size chart below before making your purchase. Chest measurements must be taken at the widest part of childs upper body, either their upper chest or lower belly, whichever is larger, for accuracy. Size 8 - Chest = Approx 31.5" Length = Approx 18.5"
Size 10 - Chest = Approx 34" Length = Approx 19.5"
Size 12 - Chest = Approx 36" Length = Approx 20.5"
Size 14 - Chest = Approx 36.5" Length = Approx 21.5"
Size 16 - Chest = Approx 38" Length = Approx 22.25"
Size 18 - Chest = Approx 38.5" Length = Approx 22.5"
Size 20 - Chest = Approx 39.5" Length = Approx 23.25"
Neck Tie = 2" Wide at base. Length is size proportionate. Tie on. Bowtie = 2" High x 4" Wide with size adjustable clasp neck. Handkerchief = 8" x 8"
100% Luxury Microfiber Construction. Dry Clean Only. Beautifully made European Style Diamond Patterned Vest. French faux pockets provide a sophisticated and stylish décor to the outer façade of this formal vest. This vest has 4 button frontal closure and a fully adjustable back for customizing your child's perfect fit. Vest back is black. Necktie is traditional tie on neck. Bow Tie is size adjustable clasp neck. This set includes one formal Vest, one matching Necktie, one matching Bow Tie and one matching Handkerchief / Pocket Square. Everything you need for that special formal event. AN INCREDIBLE VALUE! Huge selection of colors! We are THE source for quality formal boys vests for weddings, bar mitzvah, communion, christening, uniforms, graduation, school events, church choirs, plays and group events. PLEASE READ our sizing chart in the description section below to find your perfect fit before purchasing. If you have any questions about this product by Ferrecci, contact us by completing and submitting the form below. If you are looking for a specif part number, please include it with your message.